A purpose built lamp for reading, these lamps are designed in such a way that a book can be placed immediately under the lamp, with the shade protecting the eyes and forcing the light downwards. 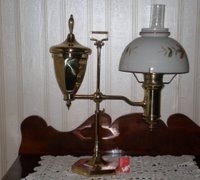 It has a removable font on the opposite side of the stem to balance the lamp. The student lamp is unique in design but is also an example of form following function. 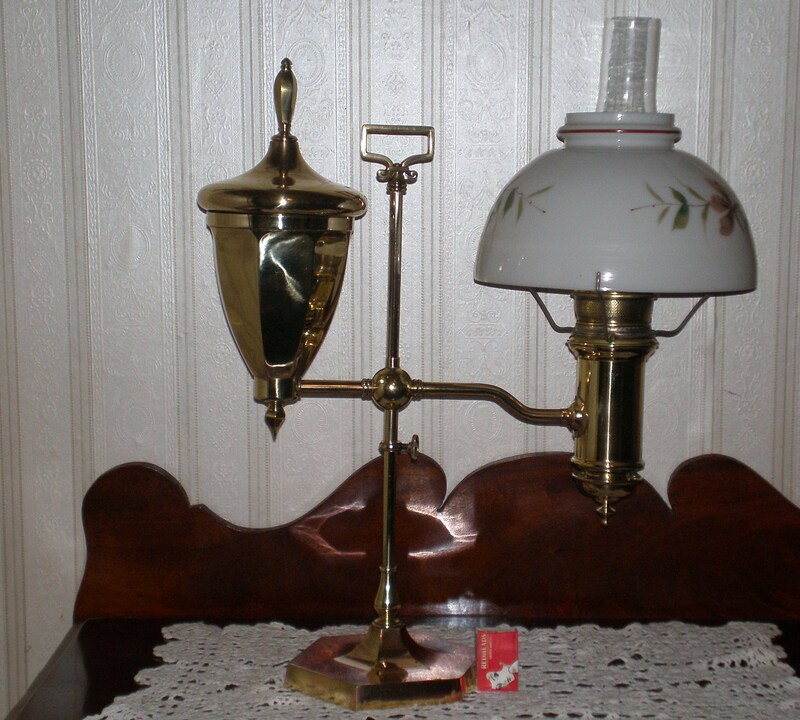 A very stable lamp, with a heavy cast base covered by a brass, the lamp can be swiveled around horizontally to the exact position required by the reader, at the same time, raised or lowered as needed. Student lamps came in the three sizes, the smaller No. 0, the No. 1 and the larger No. 2. 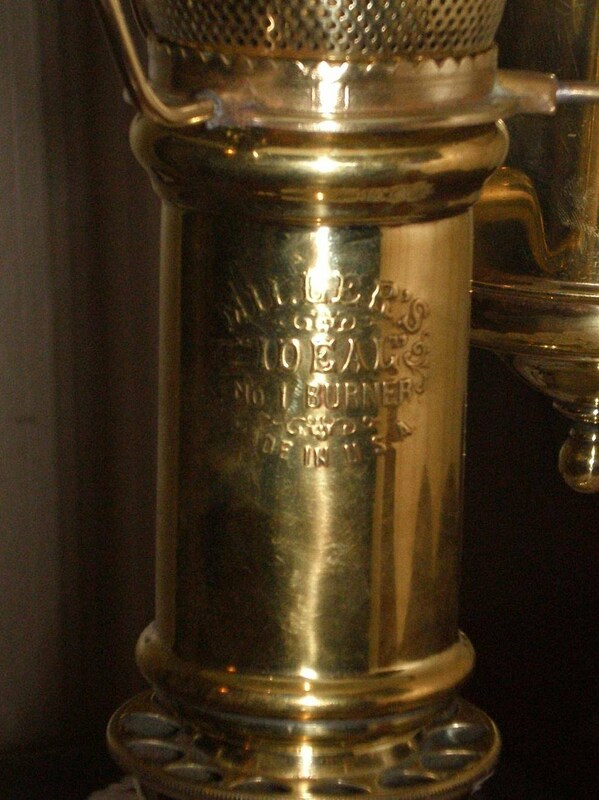 Like all Miller lamps, they were produced from the various patents, both brass and nickel and with varying degrees of decoration and double varieties were available. The way the kerosene is fed to the burner of this lamp is also unique. The removable tank has on its underside a valve, allowing it to be placed right way up inside the font without leaking. When in the font, a leaver at the base opens the valve. Kerosene flows by gravity through the connecting tube to the burner well. The valve limits the pressure of the kerosene and prevents it from overwhelming the wick tube. Fitted with a Miller No. 0 central draught burner it is very economical to use. Its light output is ideal for close usage. Miller had some difficulty in incorporating his wick raising devise into these more unusual lamps. This lamp displays superbly with its original nickel plating finish and is embossed on the wick tube 'The Miller Lamp, made in the USA' . Is seen here with an original victorian 'slant' 7" milkglass shade. Hieght to top of carry ring 20", Total Width (fount to outer of shade) 13"
Fitted with a Miller No. 0 ‘Vestal’ central draught burner it is very economical to use. Its light output is ideal for close usage. As can be seen, the 'Vestal' patent was much more convienent for use with the Student Lamp. Like most of the 'vestal' patent student lamps is unembossed. This lamp has a polished steel rather than brass stem, with a brass sleeve preventing the lamp from being lowered too far. The original 7" slant milkglass shade is typical for this type of lamp. Fitted with the Miller No. 1 ‘Ideal’ central draught burner these double student lamps are highly sought after and hard to come by. Economical to use, they were most often seen in public libraries or better private studies/sitting rooms. Its light output is ideal for close usage. This lamp has the earlier type of ideal burners in that the thumbsweel is incorporated into the wick cylinders of the lamp. Fitted with three piece bayonet type burners the 'wick cylinder' is embossed 'Miller's Ideal student Lamp' and is displayed here with two original 10" shade rings, the collar of which resembles those usually found on tripods attached to Vestal lamps. Seen here with a pair of original milkglass shades, these lamps were often originally sold with coloured 'white cased' shades in darker colours. Dark on the outside to prevent light glaring you in the eye, but white internally so as to reflect light downwards onto your book. 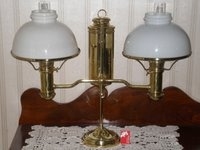 See 'Resotoring Miller Lamps' for some photographs showing the restoration of this lamp. Hieght to top of carry ring 20", Total width (outside of shade to outside of shade) 27 1/2"
Fitted with a Miller No. 2 ‘Ideal’ central draught screw thread burner (similar to the vestal burner but where the thumbwheel enters the burner to the side rather than perpendicular). The lamp has an impressive octagonal design in both the base and fount. With the square carry handle has the look and would be Edwardian. Fitted with an orginal 10" shade it is likely that originally the lamp would have has a 10" shade ring, rather than an open tripod. Its light output is ideal for open reading. Although unembossed the case base does have an impression EM & Co. on its underside. Also known as a 'double' student lamp. Hieght to top of carry ring 20", Total width (fount to outer of shade) 20"